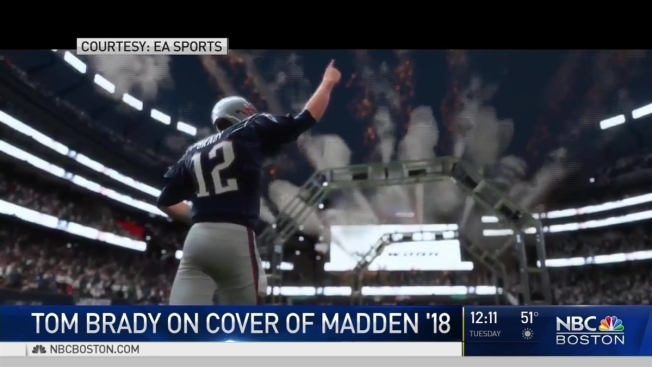 EA Sports announced Friday that New England Patriots quarterback Tom Brady will grace the cover of the new "Madden 18" game, set for release Aug. 25. The game is even titled "G.O.A.T Edition," in his honor. Of course, this may be cause for concern for some Pats fans. For years, people have been talking about the so-called "Madden curse," where whatever player is featured on the cover of the popular video game winds up getting injured that season. Last year, Patriots tight end Rob Gronkowski made the cover. He injured his back against the Seattle Seahawks in November and missed the rest of the season. Other players who have been featured on the cover who went on to get injured include Daunte Culpepper, Marshall Faulk, Michael Vick, Donovan McNabb, Shaun Alexander and Vince Young. But Brady said he's not worried. In a video posted to his Facebook page, he called the curse "a myth," while committing acts widely believed to be bad luck, like breaking a mirror and walking under a ladder. "There's no such things as curses," Brady said. "It's a total myth." So don't worry Patriots fans. You've got nothing to worry about... we think.